This example shows you the features that PROC IRT provides for unidimensional analysis. The data set comes from the 1978 Quality of American Life Survey. The survey was administered to a sample of all US residents aged 18 years and older in 1978. In this survey, subjects were asked to rate their satisfaction with many different aspects of their lives. This example selects eight items. These items are designed to measure people’s satisfaction in the following areas on a seven-point scale: community, neighborhood, dwelling unit, life in the United States, amount of education received, own health, job, and how spare time is spent. For illustration purposes, the first five items are dichotomized and the last three items are collapsed into three levels. The following DATA step creates the data set IrtUni. 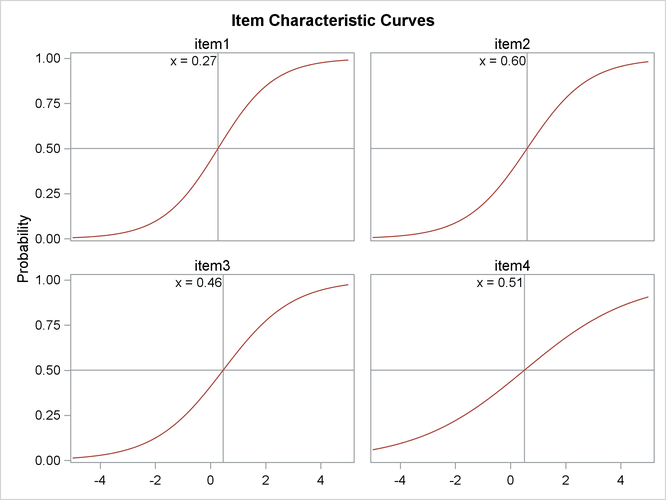 The ODS GRAPHICS ON statement invokes the ODS Graphics environment and displays the plots, such as the item characteristic curve plot. For more information about ODS Graphics, see Chapter 21: Statistical Graphics Using ODS. The first option is the LINK= option, which specifies that the link function be the probit link. Next, you request initial parameter estimates by using the PINITIAL option. Item fit statistics are displayed using the ITEMFIT option. In the PROC IRT statement, you can use the PLOTS option to request different plots. In this example, you request item characteristic curves by using the PLOTS=ICC option. In this example, you use the MODEL statement to specify different response models for different items. The specifications in the MODEL statement suggest that the first four items, item1 to item4, are fitted using the two-parameter model, whereas the last four items, item5 to item8, are fitted using the graded response model. Output 65.1.1 displays two tables. From the "Modeling Information" table, you can observe that the link function has changed from the default LOGIT link to the specified PROBIT link. The "Item Information" table shows that item1 to item5 each have two levels and item6 to item8 each have three levels. The last column shows the raw values of these different levels. Output 65.1.2 displays the classical item statistics table, which include the item means, item-total correlations, adjusted item-total correlations, and item means for i ordered groups of observations or individuals. You can produce this table by specifying the ITEMSTAT option in the PROC IRT statement. PROC IRT produces the "Eigenvalues of the Polychoric Correlation Matrix" table in Output 65.1.3 by default. You can use these eigenvalues to assess the dimension of latent factors. For this example, the fact that only the first eigenvalue is greater than 1 suggests that a one-factor model for the items is reasonable. To get an overall idea of the correlations among all the items in the analysis, you can request the polychoric correlation matrix and the corresponding heat map. When you have a large number of items in the analysis, the heat map is especially useful to help you find patterns among these items. To produce the polychoric correlation matrix, specify the POLYCHORIC option in the PROC IRT statement. 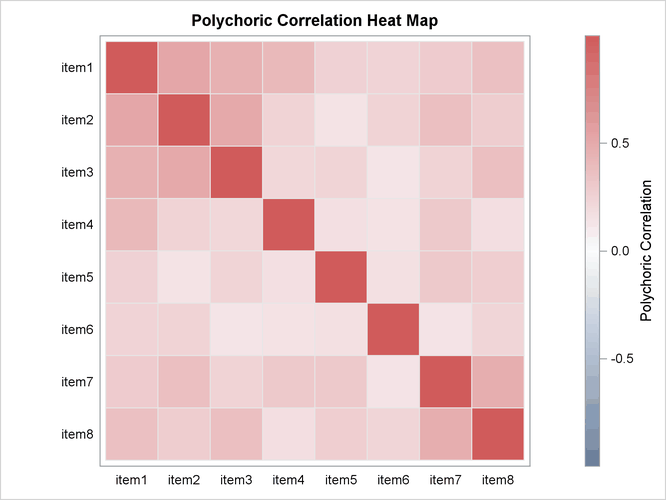 Specify PLOTS=POLYCHORIC to get the heat map for the polychoric correlation matrix. Output 65.1.4 includes the polychoric correlation table for this example, and Output 65.1.5 includes the heat map. The PINITIAL option in the PROC IRT statement displays the "Initial Item Parameter Estimates" table, shown in Output 65.1.6. Output 65.1.7 includes tables that are related to the optimization. The "Optimization Information" table shows that the log likelihood is approximated by using seven adaptive Gauss-Hermite quadrature points and then maximized by using the quasi-Newton algorithm. The number of free parameters in this example is 19. The "Iteration History" table shows the number of function evaluations, the objective function (– likelihood divided by number of subjects) values, the objective function change, and the maximum gradient for each iteration. This information is very useful in monitoring the optimization status. Output 65.1.7 shows the convergence status at the bottom. The optimization converges according to the GCONV=0.00000001 criterion. Output 65.1.8 displays the model fit and item fit statistics. Note that the item fit statistics apply only to the binary items. That is why these fit statistics are missing for item6 to item8. The last table for this example is the "Item Parameter Estimates " table in Output 65.1.9. This table contains parameter estimates, standard errors, and p-values. These p-values suggest that all the parameters are significantly different from zero. 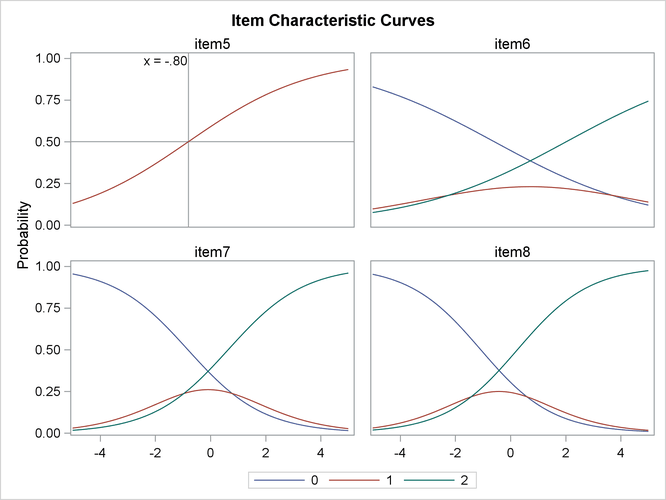 Item characteristic curves (ICC) are also produced in this example. By default, these ICC plots are displayed in panels. To display an individual ICC plot for each item, use the UNPACK suboption in the PLOTS= option in the PROC IRT statement. Sometimes you might find it useful to sort the items based on the estimated difficulty or slope parameters. You can do this by outputting the ODS tables for the estimates into data sets and then sorting the items by using PROC SORT. A simulated data set is used to show the steps. Output 65.1.11 shows the "Item Parameter Estimates" table. Notice that the difficulty and slope parameters are in the same column. The reason for this is to avoid having an extremely wide table when each item has a lot of parameters. The two SAS data sets are shown in Output 65.1.12 and Output 65.1.13. Output 65.1.14 and Output 65.1.15 show the sorted data sets. Notice that the sorting does not work correctly if any of the items have more than one threshold (ordinal response) or slope (multidimensional model). Output 65.1.16 shows the merged data set. Output 65.1.17 shows the data set after sorting.